Bitcoin is not officially recognised as a currency by HMRC but it shares a lot of similarities with 'mainstream' currencies. New digital products evolve on a weekly basis. Many of these are not currency-like but are definitely corporeal and fungible. Do we tax gains or profits as capital or income? We have a look at the position for individuals. The position for companies is undoubtably more complex, think intangibles and loan relationships. I won't be attempting a guide for companies for sometime so please try not to ask for one. On to Making Tax Digital for VAT or MVD (making VAT digital) as we like to call it and new filing software obligations. We have created a new interactive tool that will assist you and hopefully your clients in working out what, where and why. HMRC's Jon Thompson says that HMRC will take the decision as to whether MVD goes ahead as planned at their next board meeting in October. Also this week, lots of topical cases. Are referees self employed and what happens if you make losses for 17 years on the trot? I was not going to mention Brexit because enough is enough in one short lifetime, but it's party conference time and I will definitely try to get to one if I can. There are tax debates with the CIOT and IFS on the future of tax at some of these conferences. If you have any tax queries please do try out our Virtual Tax Partner support portal at www.VtaxP.co.uk: subscribers you are entitled to free quick queries so do ask. The portal has just had a facelift and I hope you will like it. Enjoy the guides and updates and the news is below. HMRC have opened a new consultation “Discussion Document on HMRC’s anti-money laundering supervision fees". Although we think that we have filled our flexible job vacancies in direct and indirect tax for part-time and home-based employees we would still like to hear from you if you are interereste in working with us. In particular, if you are keen on investigations and appeals, company secretarial and VAT. How are Bitcoin, cryptocurrencies or cryptoassets taxed in the UK? NEW: we have had a lot of queries on this topic. This looks at the issue from the perspective of an individual. UPDATE: More information on the trust registration service and the annual requirement to confirm there have been no changes to the trust once it has been registered. In Excel Computer Systems PLC v HMRC  TC06561 the First Tier tribunal upheld NIC decisions for class 1A despite employees making good the private fuel provided; payment was not made within the tax year and no concession applied as the company’s fuel card policy did not meet the necessary conditions. In Ardeshir Naghshineh v HMRC  TC06631 the First tier tribunal allowed sideways loss relief claims for a farming business where losses were made for 17 years; at the start of the loss making period the reasonable expectation was that the farm would not become profitable until after the period for which relief was being claimed. In Professional Game Match Officials Limited v HMRC  TC06698 the FTT found that football referees were self-employed; there was insufficient mutuality of obligation and control to amount to employment, even though the level of integration, hours worked, and absence of being business on their own account suggested an employment relationship. In HMRC v DPAS Limited  (C-5/17), the Court of Justice for the European Union (CJEU), found that administration fees charged to patients in relation to dental plans were not exempt. HMRC have released Revenue & Customs Brief 7: VAT – motor dealer deposit contributions, providing guidance to motor retailers, finance companies, and businesses who have purchased vehicles with a dealer deposit contribution. HMRC have published draft legislation which will introduce changes proposed by the EU and ease the VAT burden for some businesses that provide e-services. UPDATE: reformatted as a guide to the approach to take when establishing place of supply of services, and more information added regarding exceptions to the general rule. Car or Van for VAT? UPDATE: updated flowchart to determine if it is a car or a van for VAT purposes. Subscribe (and UNLOCK the whole site) A single user annual subscription is £365 (+ VAT). We keep YOU up to date in SME tax. 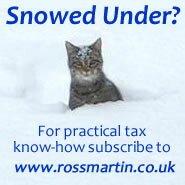 FULL access to www.rossmartin.co.uk: your firm's personal TAX INTRANET containing over 2,500 actively maintained tax guides, briefings, toolkits and checklists. Want to know more? Commission your own articles and checklists. Structured CPD: our detailed SME tax updates "for Advisers Only" provide topical summaries and planning notes & our NEW webcasts provide you with structured CPD at your desk. Regular client tax briefings: these cover the latest business and employment tax issues and are designed to assist you plan meetings and improve your client services.